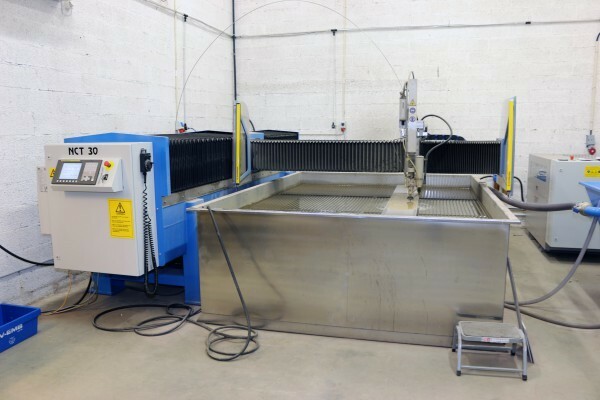 Fast ROI from waterjet machine investment and its unexpected benefits. - We looked where we had our biggest purchases and realized we bought waterjet cutting services for 1.5 million SEK last year, says Mathias Ytreeide, production manager at Concept Sweden. We thought it was about time to find another solution. To produce customer specific machines, they have a well-equipped workshop with several Mills, a lathe and a large selection of hand tools. Each machine build means some kind of customization. Now, the machinery has been extended with a new waterjet cutting machine from Water Jet Sweden - the new multi-purpose system, T-model Advanced. • We looked at three different suppliers of waterjet cutting machines, and we chose Water Jet Sweden. They had the best offer and the sales rep lay on and showed more interest than the others. Some functions, like Height Sensor, was included, while the other offered them as option, and their machine also was of a smaller size, with less cutting area, said Mathias. Waterjet Sweden gave us the best value for money and a fast ROI (Return On Investment). • The training was incredibly good. The technician was calm and experienced, and we were in full production already the day after, tells Mathias. It has been very successful. It's quick and easy to prepare jobs, and the machine keeps running while we’re doing other jobs at the same time. • Some of us were worried that it would be dirty and noisy, but there are no problems at all. We have the waterjet machine in a separate room, and with some simple daily maintenance there is no problem at all with dirt, says Mathias who has his own workplace next to waterjet cutting room. After half a year Concept Sweden sees positive effects from the investment, to change and manufacture waterjet parts in-house has proven profitable. Another unexpected benefit of having our own waterjet cutting machine is that it also has improved service towards their existing customers. • Most parts we cut with the waterjet is for our own products, but we also do occasional cutting jobs for our existing customers. Often it is quicker for us to fix the parts that they need rather than to go to someone else who don’t know their product. It is both more simple and cheaper, says Mathias. The fast ROI from investing in a waterjet cutting machine seen by Concept Sweden AB might be applicable to your company as well. Feel free to contact Water Jet Sweden for further information. 1. Concept Sweden office in Gothenburg, on the west coasts of Sweden. 6. The training was incredibly good and we were in full production already the day after, tells Mathias. 7. At a desk beside the machine the CAD/CAM programs are prepared. 12. An unexpected benefit is the occasional cutting jobs for our existing customers. It often is quicker for us to fix the parts that they need. A successful pursuit of measurable customer benefits Back in 1993, we produced our Machines in a private garage. Today we serve customers in more than 40 countries. Our native town of Ronneby in southern Sweden has become a R & D cluster of global renown, where the scientific establishment, the water jet industry and the business community join efforts to develop the water jet cutting technology of tomorrow.